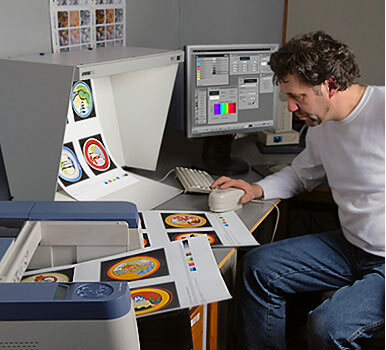 Accurate RGB to CMYK file conversion & 'Contract proofs' for succcessful printing. High fidelity print does not just happen. Producing pictures of an uncompromising quality, and ensuring everything is right is what our reputation's been built on. Therefore it makes sense to rely on our knowledge and experience, to carry your project through to a successful completion, when important printing is involved. Achieving reliable, top quality printed work involves a number of steps, each being dependent on the previous one. The cost difference between a poor and an excellent job is often minimal; however the ramifications may be significant for you! Your archive images should be in RGB because these spaces hold the largest amount of colour information. However these files will need conversion to CMYK before they can be used for commercial printing. Conversion is not a 'push-button' job if predictable and excellent results are wanted. Beware if offered this 'for free' as there is no such thing as a free lunch, especially in the print world. 'Contract proofs' will be needed. These are colour accurate prints made from the prepared CMYK digital files, and must be capable of being matched on press. Without proofs of this integrity, you simply have no way of knowing what to expect, and the printer has nothing to match to....a recipe for disaster. Successful print jobs are the result of proper control from start to finish. It's wise to stipulate, in measurable terms, precisely what printing variations you are prepared to accept when asking for quotations. It's too late when your job is being printed or is finished, and you are unhappy with the results. Talking to us early in a project is time well spent. Contract proofs for the Wedgwood Museum. Our contract proofer left, proofing booth in centre, and spectrophotometer in use.